The lovely people at the Flour Advisory Bureau sent me a great guide on making the perfect pancake - with Shrove Tuesday coming up next week, I thought I might share their advice with you. While the traditional sugar & lemon topping is still popular, more exciting flavour combinations & cooking techniques have been emerging, Generally, pancakes are either griddled to form smaller thicker pancakes, or fried in butter to produce a thinner crepe. Souffléd pancakes add a claassy, special edge to something which could be rather plain, while baking is an easier technique which can produce a similar effect. Nonetheless, the quickest way to cook pancakes is to fry them. It can be hard to achieve perfect pancakes, so if you struggle to get them spot on then follow the Flour Advisory Bureau’s top tips. Here's a guide to what you may have been doing wrong. 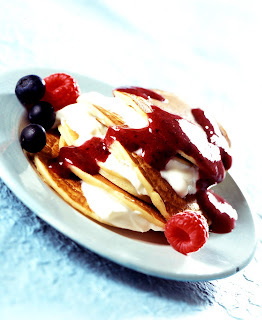 Soggy pancakes – the batter may be too thick or you may have used too much batter, the pancake may be undercooked or you may not have enough fat in the frying pan. Broken pancakes – The batter may be too thin or you may not have used enough egg in your batter recipe. Pancakes that are difficult to roll or fold – Either the batter or pancakes are too thick or the pancakes may be overcooked. Measure the ingredients exactly to ensure that the batter reaches the right consistency. Mix the ingredients using a large whisk until the dry ingredients have just been mixed in. The larger the whisk, the more air you can whip into the batter, which will help to produce light, fluffy pancakes. Heat the pan for two or three minutes before adding the fat to ensure that it doesn’t burn. An olive oil spray is not only a good option for those who are concerned about the fat content, it also has a high burning temperature which helps to keep the flavour of the pancake delicate. One ladles worth of pancake batter is usually sufficient to make one perfect pancake. You only need to flip each pancake once to avoid overcooking and toughening the pancakes. So, what's your favourite pancake on Shrove Tuesday? Please let me know in the comments box! p.s. My favourite sweet one is warm apples with fleur du sel caramel & a giant blob of creme fraiche.